Bhutan is endowed with an outstanding natural environment. It is dubbed as the ‘crown jewel’ of the Eastern Himalayas, a region recognised as a global biodiversity hotspot. Broadly speaking, the natural habitats range from the subtropical broadleaf forests and grasslands through temperate mountain forests to alpine meadows interspersed with marshlands and various water bodies. Despite a nascent conservation research capacity, the country has hitherto recorded 5,603 species of vascular plants, including 369 species of orchids and 46 species of rhododendrons. Of the recorded plant species, 105 species are endemic – found nowhere else in the world. Mammal species in the wild number close to 200 and these include some of the world’s most threatened species such as the Bengal Tiger, Snow Leopard, Asian Elephant, Red Panda, Golden Langur, and Takin, the country’s national animal. Bird fauna is also outstanding. 678 species have been recorded, including 14 that are globally threatened. To maintain the rich natural biodiversity, 42.71% of the country has been declared as protected, which includes five national parks, four wildlife sanctuaries and a strict nature reserve. Forests account for more than 70% of the country’s land cover – one of the highest in the world. As a result of the vast forest cover and limited number of polluting industries, Bhutan is among the few countries in the world with net greenhouse gas (GHG) emission in negative. Forest resources and biodiversity constitute the country’s most important natural resource. The country’s biodiversity is a major source of livelihood for the country’s rural communities who live in close interaction with their natural environment. Rural artisans produce bamboo and cane handicrafts, various kinds of woodwork and textiles using natural dye for income generation. In addition, local people collect a wide range of edible, medicinal and aromatic plants for cash income. Bhutan has achieved most of the MDG targets, as it successfully aligned the MDGs with national priorities and integrated them into the national development planning framework. Also, the development philosophy of GNH provided an enabling environment to mainstream the MDGs. With the rich natural biodiversity of both the animals, plants and other species, the threats and challenges are evident in the country, which also is the home of some of the endangered species of the world. Balancing development and natural biodiversity seems an uphill task where both are considered vital in today’s context. Rapid modernisation, the adoption of democracy and change in the country’s demographics have posed threats and challenges to the harmonious existence of biodiversity. The land conversion, overexploitation, dependence on wood for fuel, pollution by domestic sewage, climate change and forest fires are some imminent threat posed to the country’s biodiversity. The state of the country’s development process and their associated needs for forest products, infrastructure development, population growth and living space requirements, rapid urbanisation, agricultural expansion, grazing pressures and forest fires threatens the harmonious nature. Likewise, pressure on water resources has highetened overtime as a result of growing urbanisation and industrialisation. Finally, specific threats to domesticated biodiversity include unsustainable cropping practices, agricultural land conversion, cultivation of exotic agricultural crops and land degradation in the form of erosion. Also, the hydropower development, the economic engine of the country’s revenue is no exception to the threat. Threat to natural biodiversity especially with the aquatic animals is obvious with the diversion of natural rivers with the dams. And pollution from the hydropower developments supplements too. The rural-urban migration with the hope of better lifestyles in the city is also the cause for the loss of affection towards the nature unlike in the past. Conservation of natural environment, being one of the four pillars of Gross National Happiness (GNH) philosophy, Bhutan strives to preserve more than 60 percent forest cover in its constitution which is indeed achieved with more than 70 percent at present. 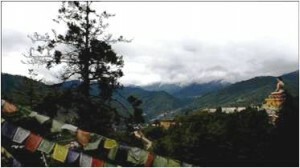 Bhutan has developed and implemented three Biodiversity Action Plans, the first in 1998, the second in 2002 and the third in 2009, with implementation in regard to the latter still in process. Serving a home for native wildlife including the endangered species, the country’s effort to preserve its forest cover seems more realistic in nature looking at the roles it plays. Also the country has constantly been moving forward with environmental conservation initiatives to keep the forest cover intact. The recent adoption of Bio Safety Bill, 2014 in the parliament is also a welcoming step from the Bhutanese parliamentarians. Bhutanese are natural nature lovers with the nature surrounding the environment. With the pace of economic development with hydropower as forerunner in this century, nature has faced constant destruction throwing a bigger challenge for harmonious existence to the biodiversity. Dominated with the Buddhist beliefs of ‘Be good and do good’ kind of philosophies, harm to the natural biodiversity in not much entertained in the society except for genuine reason. The old age practices of loving nature are degrading with the youths focused away from the environment conservation initiatives. The veteran nature lovers raise concern over the worrying facts of nature being harmed in the name of development. Mr Sangay, aged 70 says “we are left with no option than to watch buildings replace the beautiful trees,” pointing to the town which was once covered with thick pine forest. “I am really worried what our future will do to our mother nature,” he further said. With more number of trees chopped down through hydropower developments, people expects for the replacement of the very natural vegetation. “It would be best to replant there. If not mother earth would not forgive us,” 56 years old Dorji. While some shows sympathy for the nature, other finds okay with the development which is necessary. “We have enough forest covers. So development is also necessary. But we must not cross the limit,” said 26 year old Puran Lama. People’s attachment with the nature from umpteenth years has developed the love and care for the nature in the citizen’s hearts. Conservation of the natural environment being one of the four pillars of the Gross National Happiness (GNH) philosophy, Bhutan strives to preserve more than 60% forest cover in its constitution which is indeed achieved with more than 70% at present. Bhutan has developed and implemented three Biodiversity Action Plans, the first in 1998, the second in 2002 and the third in 2009. The implementation in regard to the latter is still in process. Also the country has been constantly moving forward with environmental conservation initiatives to keep its forest cover intact. The recent adoption of the Bio Safety Bill, 2014 in the parliament is also a welcoming step by the Bhutanese parliamentarians. In parallel with the government’s efforts, the Bhutanese people too are taking conservation initiatives. June 2nd, the coronation day of the Fourth Druk Gyalpo, Jigme Singye Wangchuck is also celebrated nationwide as the ‘Social Forestry Day’. The most trending example is the People’s Initiative in Celebrating the Sixtieth Anniversary (PICSA) of His Majesty, the Fourth Druk Gyalpo in collaboration with the Ministry of Agriculture and Forests this year.This initiative will see 100 men carry out a mass tree plantation drive to plant 50,000 trees within an hour in an attempt to enter the Guinness Book of World Record. 1 All species and protected area figures are cited from the Biodiversity Action Plan of Bhutan 2009.